What Was Woodrow Wilson's 14 Points Speech? On Jan. 8, 1918, President Woodrow Wilson stood in front of a joint session of Congress and gave a speech known as "The Fourteen Points." At the time, the world was embroiled in the First World War and Wilson was hoping to find a way to not only end the war peacefully but to ensure it never would happen again. Today and then, Woodrow Wilson is viewed as both a highly intelligent president and a hopeless idealist. The Fourteen Points speech was in part based on Wilson's own diplomatic leanings, but also written with the research assistance of his secret panel of experts known as "The Inquiry." These men included the likes of crusading journalist Walter Lippman and several distinguished historians, geographers, and political scientists. The Inquiry was led by presidential advisor Edward House and assembled in 1917 to help Wilson prepare to start negotiations to end World War I. Much of the intent of Wilson's Fourteen Points speech was to oversee the breakup of the Austro-Hungarian empire, set out the overarching rules of behavior, and ensure that the United States would only play a minor role in the reconstruction. Wilson considered self-determination a crucial part of the successful establishment of the disparate states in the aftermath of the war. At the same time, Wilson himself recognized the inherent danger in creating states whose populations were ethnically divided. Returning Alsace-Lorraine to France, and restoring Belgium were relatively straightforward. But what to do about Serbia, with a major percentage of the non-Serbian population? How could Poland have access to the sea without including territories owned by ethnic Germans? How can Czechoslovakia include three million ethnic Germans in Bohemia? 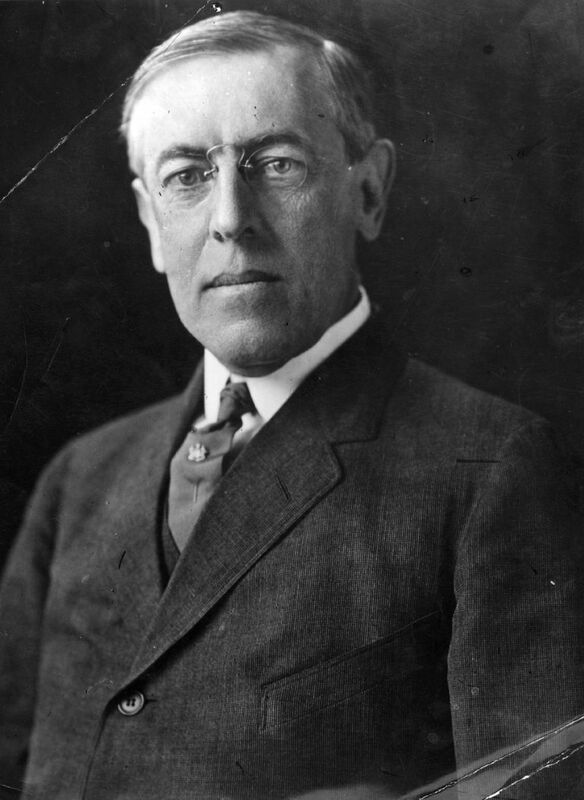 The decisions that were made by Wilson and The Inquiry did not resolve those conflicts, although it is likely that Wilson's 14th point creating a League of Nations, was proffered in an attempt to build infrastructure to resolve those conflicts going forward. But the same dilemma exists unresolved today: How to safely balance self-determination and ethnic disparity? Since many of the countries involved in WWI had been drawn into it to honor long-standing, private alliances, Wilson asked that there be no more secret alliances (Point 1). And since the United States had specifically entered the war because of Germany's announcement of unlimited submarine warfare, Wilson advocated for the open use of the seas (Point 2). Wilson also proposed open trade between countries (Point 3) and the reduction of armaments (Point 4). Point 5 addressed the needs of colonial peoples and Points 6 through 13 discussed specific land claims per country. Point 14 was the most important on Woodrow Wilson's list; it advocated for an international organization to be established that would be responsible for helping to keep peace among the nations. This organization was later established and called the League of Nations. Wilson's speech was well received in the United States, with some notable exceptions, including former president Theodore Roosevelt, who described it as both "high-sounding" and "meaningless." The Fourteen Points were accepted by the Allied Powers, as well as by Germany and Austria as the basis for peace negotiations. The only covenant of the League of Nations that was totally rejected by the allies was a provision pledging the members of the league to ensure religious freedom. However, Wilson became physically ill at the start of the Paris Peace Conference, and French Prime Minister Georges Clemenceau was able to advance his own country's demands beyond what was laid out in the 14 Points speech. The differences between the Fourteen Points and the resulting Treaty of Versailles raised great anger in Germany, leading to the rise of National Socialism, and ultimately the Second World War. The Russian representatives have insisted, very justly, very wisely, and in the true spirit of modern democracy, that the conferences they have been holding with the Teutonic and Turkish statesmen should be held within open, not closed, doors, and all the world has been the audience, as was desired. To whom have we been listening, then? To those who speak the spirit and intention of the resolutions of the German Reichstag of the 9th of July last, the spirit and intention of the Liberal leaders and parties of Germany, or to those who resist and defy that spirit and intention and insist upon conquest and subjugation? Or are we listening, in fact, to both, unreconciled and in open and hopeless contradiction? These are very serious and pregnant questions. Upon the answer to them depends the peace of the world. But, whatever the results of the parleys at Brest-Litovsk, whatever the confusions of counsel and of purpose in the utterances of the spokesmen of the Central Empires, they have again attempted to acquaint the world with their objects in the war and have again challenged their adversaries to say what their objects are and what sort of settlement they would deem just and satisfactory. There is no good reason why that challenge should not be responded to and responded to with the utmost candor. We did not wait for it. Not once, but again and again, we have laid our whole thought and purpose before the world, not in general terms only, but each time with sufficient definition to make it clear what sort of definite terms of settlement must necessarily spring out of them. Within the last week, Mr. Lloyd George has spoken with admirable candor and in admirable spirit for the people and Government of Great Britain. There is no confusion of counsel among the adversaries of the Central Powers, no uncertainty of principle, no vagueness of detail. The only secrecy of counsel, the only lack of fearless frankness, the only failure to make a definite statement of the objects of the war, lies with Germany and her allies. The issues of life and death hang upon these definitions. No statesman who has the least conception of his responsibility ought for a moment to permit himself to continue this tragical and appalling outpouring of blood and treasure unless he is sure beyond a peradventure that the objects of the vital sacrifice are part and parcel of the very life of Society and that the people for whom he speaks think them right and imperative as he does. They call to us to say what it is that we desire, in what, if in anything, our purpose and our spirit differ from theirs; and I believe that the people of the United States would wish me to respond, with utter simplicity and frankness. Whether their present leaders, believe it or not, it is our heartfelt desire and hopes that some way may be opened whereby we may be privileged to assist the people of Russia to attain their utmost hope of liberty and ordered peace. VII. Belgium, the whole world will agree, must be evacuated and restored, without any attempt to limit the sovereignty which she enjoys in common with all other free nations. No other single act will serve as this will serve to restore confidence among the nations in the laws which they have themselves set and determined for the government of their relations with one another. Without this healing act, the whole structure and validity of international law is forever impaired. In regard to these essential rectifications of wrong and assertions of right, we feel ourselves to be intimate partners of all the governments and peoples associated together against the Imperialists. We cannot be separated in interest or divided in purpose. We stand together until the end. For such arrangements and covenants, we are willing to fight and to continue to fight until they are achieved; but only because we wish the right to prevail and desire a just and stable peace such as can be secured only by removing the chief provocations to war, which this program does remove. We have no jealousy of German greatness, and there is nothing in this program that impairs it. We grudge her no achievement or distinction of learning or of pacific enterprise such as have made her record very bright and very enviable. We do not wish to injure her or to block in any way her legitimate influence or power. We do not wish to fight her either with arms or with hostile arrangements of trade if she is willing to associate herself with us and the other peace-loving nations of the world in covenants of justice and law and fair dealing. We wish her only to accept a place of equality among the peoples of the world,—the new world in which we now live,—instead of a place of mastery. Unless this principle be made its foundation no part of the structure of international justice can stand. The people of the United States could act upon no other principle; and to the vindication of this principle, they are ready to devote their lives, their honor, and everything they possess. The moral climax of this the culminating and final war for human liberty has come, and they are ready to put their own strength, their own highest purpose, their own integrity and devotion to the test. Chace, James. "The Wilsonian Moment?" The Wilson Quarterly (1976-) 25.4 (2001): 34-41. Print. Jacobson, Harold K. "Structuring the Global System: American Contributions to International Organization." The Annals of the American Academy of Political and Social Science 428 (1976): 77-90. Print. Lynch, Allen. "Woodrow Wilson and the Principle of 'National Self-Determination': A Reconsideration." Review of International Studies 28.2 (2002): 419-36. Print. Tucker, Robert W. "Woodrow Wilson's 'New Diplomacy'." World Policy Journal 21.2 (2004): 92-107. Print.